The British Armed Forces,[nb 2] also known as Her Majesty's Armed Forces, are the military services responsible for the defence of the United Kingdom, its overseas territories and the Crown dependencies. They also promote Britain's wider interests, support international peacekeeping efforts and provide humanitarian aid. Since the formation of a Kingdom of Great Britain in 1707 (later succeeded by the United Kingdom), the armed forces have seen action in a number of major wars involving the world's great powers, including the Seven Years' War, the Napoleonic Wars, the Crimean War, the First World War, and the Second World War. Repeatedly emerging victorious from conflicts has allowed Britain to establish itself as one of the world's leading military and economic powers. Today, the British Armed Forces consist of: the Royal Navy, a blue-water navy with a fleet of 75 commissioned ships, together with the Royal Marines, a highly specialised amphibious light infantry force; the British Army, the UK's principal land warfare branch; and the Royal Air Force, a technologically sophisticated air force with a diverse operational fleet consisting of both fixed-wing and rotary aircraft. The British Armed Forces include standing forces, Regular Reserve, Volunteer Reserves and Sponsored Reserves. Its Commander-in-chief is the British monarch, currently Queen Elizabeth II, to whom members of the forces swear allegiance. The UK Parliament approves the continued existence of the British Army by passing an Armed Forces Act at least once every five years, as required by the Bill of Rights 1689. The Royal Navy, Royal Air Force and Royal Marines among with all other forces do not require this act. The armed forces are managed by the Defence Council of the Ministry of Defence, headed by the Secretary of State for Defence. The United Kingdom is one of five recognised nuclear powers, is a permanent member on the United Nations Security Council, is a founding and leading member of the NATO military alliance, and is party to the Five Power Defence Arrangements. Overseas garrisons and facilities are maintained at Ascension Island, Bahrain, Belize, Bermuda, British Indian Ocean Territory, Brunei, Canada, Cyprus, the Falkland Islands, Germany, Gibraltar, Kenya, Montserrat, Nepal, Qatar, Singapore and the United States. With the Acts of Union 1707, the armed forces of England and Scotland were merged into the armed forces of the Kingdom of Great Britain. During the later half of the seventeenth century, and in particular, throughout the eighteenth century, British foreign policy sought to contain the expansion of rival European powers through military, diplomatic and commercial means – especially of its chief competitors; Spain, the Netherlands and France. This saw Britain engage in a number of intense conflicts over colonial possessions and world trade, including a long string of Anglo-Spanish and Anglo-Dutch wars, as well as a series of "world wars" with France, such as; the Seven Years' War (1756–1763), the French Revolutionary Wars (1792–1802) and the Napoleonic Wars (1803–1815). 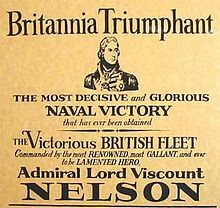 During the Napoleonic wars, the Royal Navy victory at Trafalgar (1805) under the command of Horatio Nelson (aboard HMS Victory) marked the culmination of British maritime supremacy, and left the Navy in a position of uncontested hegemony at sea. By 1815 and the conclusion of the Napoleonic Wars, Britain had risen to become the world's dominant great power and the British Empire subsequently presided over a period of relative peace, known as Pax Britannica. With Britain's old rivals no-longer a threat, the nineteenth century saw the emergence of a new rival, the Russian Empire, and a strategic competition in what became known as The Great Game for supremacy in Central Asia. Britain feared that Russian expansionism in the region would eventually threaten the Empire in India. In response, Britain undertook a number of pre-emptive actions against perceived Russian ambitions, including the First Anglo-Afghan War (1839–1842), the Second Anglo-Afghan War (1878–1880) and the British expedition to Tibet (1903–1904). During this period, Britain also sought to maintain the balance of power in Europe, particularly against Russian expansionism, who at the expense of the waning Ottoman Empire had ambitions to "carve up the European part of Turkey". This ultimately led to British involvement in the Crimean War (1854–1856) against the Russian Empire. Soldiers from the Royal Irish Rifles in the Battle of the Somme's trenches 1916. The beginning of the twentieth century served to reduce tensions between Britain and the Russian Empire, partly due to the emergence of a unified German Empire. The era brought about an Anglo-German naval arms race which encouraged significant advancements in maritime technology (e.g. Dreadnoughts, torpedoes and submarines), and in 1906, Britain had determined that its only likely naval enemy was Germany. 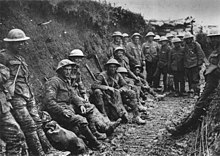 The accumulated tensions in European relations finally broke out into the hostilities of the First World War (1914–1918), in what is recognised today, as the most devastating war in British military history, with nearly 800,000 men killed and over 2 million wounded. Allied victory resulted in the defeat of the Central Powers, the end of the German Empire, the Treaty of Versailles and the establishment of the League of Nations. Although Germany had been defeated during the First World War, by 1933 fascism had given rise to Nazi Germany, which under the leadership of Adolf Hitler re-militarised in defiance of the Treaty of Versailles. Once again tensions accumulated in European relations, and following Germany's invasion of Poland in September 1939, the Second World War began (1939–1945). The conflict was the most widespread in British history, with British Empire and Commonwealth troops fighting in campaigns from Europe and North Africa, to the Middle East and the Far East. Approximately 390,000 British Empire and Commonwealth troops lost their lives. Allied victory resulted in the defeat of the Axis powers and the establishment of the United Nations (replacing the League of nations). Post–Second World War economic and political decline, as well as changing attitudes in British society and government, were reflected by the armed forces' contracting global role, and later epitomised by its political defeat during the Suez Crisis (1956). Reflecting Britain's new role in the world and the escalation of the Cold War (1947–1991), the country became a founding member of the NATO military alliance in 1949. Defence Reviews, such as those in 1957 and 1966, announced significant reductions in conventional forces, the pursuement of a doctrine based on nuclear deterrence, and a permanent military withdrawal East of Suez. By the mid-1970s, the armed forces had reconfigured to focus on the responsibilities allocated to them by NATO. The British Army of the Rhine and RAF Germany consequently represented the largest and most important overseas commitments that the armed forces had during this period, while the Royal Navy developed an anti-submarine warfare specialisation, with a particular focus on countering Soviet submarines in the Eastern Atlantic and North Sea. While NATO obligations took increased prominence, Britain nonetheless found itself engaged in a number of low-intensity conflicts, including a spate of insurgencies against colonial occupation. However the Dhofar Rebellion (1962–1976) and The Troubles (1969–1998) emerged as the primary operational concerns of the armed forces. Perhaps the most important conflict during the Cold War, at least in the context of British defence policy, was the Falklands War (1982). Since the end of the Cold War, an increasingly international role for the armed forces has been pursued, with re-structuring to deliver a greater focus on expeditionary warfare and power projection. This entailed the armed forces often constituting a major component in peacekeeping and humanitarian missions under the auspices of the United Nations, NATO, and other multinational operations, including: peacekeeping responsibilities in the Balkans and Cyprus, the 2000 intervention in Sierra Leone and participation in the UN-mandated no-fly zone over Libya (2011). Post-September 11, the armed forces have been heavily committed to the War on Terror (2001–present), with lengthy campaigns in Afghanistan (2001–present) and Iraq (2003–2009), and more recently as part of the Military intervention against ISIL (2014–present). Britain's military intervention against Islamic State was expanded following a parliamentary vote to launch a bombing campaign over Syria; an extension of the bombing campaign requested by the Iraqi government against the same group. In addition to the aerial campaign, the British Army has trained and supplied allies on the ground and the Special Air Service, the Special Boat Service, and the Special Reconnaissance Regiment (British special forces) has carried out various missions on the ground in both Syria and Iraq. Figures released by the Ministry of Defence on 31 March 2016 show that 7,185 British Armed Forces personnel have lost their lives in medal earning theatres since the end of the Second World War. As Sovereign and head of state, Queen Elizabeth II is Head of the Armed Forces and their Commander-in-Chief. Long-standing constitutional convention, however, has vested de facto executive authority, by the exercise of Royal Prerogative powers, in the Prime Minister and the Secretary of State for Defence, and the Prime Minister (acting with the support of the Cabinet) makes the key decisions on the use of the armed forces. The Queen, however, remains the ultimate authority of the military, with officers and personnel swearing allegiance to the monarch. It has been claimed that this includes the power to prevent unconstitutional use of the armed forces, including its nuclear weapons. The Ministry of Defence[nb 3] is the Government department and highest level of military headquarters charged with formulating and executing defence policy for the armed forces; it currently employs 56,860 civilian staff as of 1 October 2015. The department is controlled by the Secretary of State for Defence and contains three deputy appointments: Minister of State for the Armed Forces, Minister for Defence Procurement, and Minister for Veterans' Affairs. Responsibility for the management of the forces is delegated to a number of committees: the Defence Council, Chiefs of Staff Committee, Defence Management Board and three single-service boards. The Defence Council, composed of senior representatives of the services and the Ministry of Defence, provides the "formal legal basis for the conduct of defence". 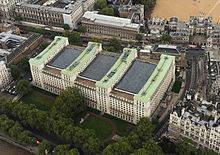 The three constituent single-service committees (Admiralty Board, Army Board and Air Force Board) are chaired by the Secretary of State for Defence. The Chief of the Defence Staff is the professional head of the armed forces and is an appointment that can be held by an Admiral, Air Chief Marshal or General. Before the practice was discontinued in the 1990s, those who were appointed to the position of CDS had been elevated to the most senior rank in their respective service (a 5-star rank). The CDS, along with the Permanent Under Secretary, are the principal advisers to the departmental minister. The three services have their own respective professional chiefs: the First Sea Lord, the Chief of the General Staff and the Chief of the Air Staff. The British Armed Forces are a professional force with a strength of 146,500 UK Regulars and Gurkhas, 36,430 Volunteer Reserves and 7,820 "Other Personnel"[nb 4] as of 1 January 2019[update]. This gives a total strength of 190,750 "UK Service Personnel". [nb 5] As a percentage breakdown of UK Service Personnel, 76.8% are UK Regulars and Gurkhas, 19.1% are Volunteer Reserves and 4.1% are composed of Other Personnel. In addition, all ex-Regular personnel retain a "statutory liability for service" and are liable to be recalled (under Section 52 of the Reserve Forces Act (RFA) 1996) for duty during wartime, which is known as the Regular Reserve. MoD publications since April 2013 no longer report the entire strength of the Regular Reserve, instead they only give a figure for Regular Reserves who serve under a fixed-term reserve contract. These contracts are similar in nature to those of the Volunteer Reserve. As of 1 April 2015[update], Regular Reserves serving under a fixed-term contract numbered 44,600 personnel. As of 1 October 2017[update], there were a total of 9,330 Regular service personnel stationed outside of the United Kingdom, 3,820 of those were located in Germany. 138,040 Regular service personnel were stationed in the United Kingdom, the majority located in the South East and South West of England with 37,520 and 36,790 Regular service personnel, respectively. According to the International Institute for Strategic Studies and the Stockholm International Peace Research Institute, the United Kingdom has the sixth- or seventh-largest defence budget in the world. For comparisons sake, this sees Britain spending more in absolute terms than France, Germany, India or Japan, a similar amount to that of Russia, but less than China, Saudi Arabia or the United States. In September 2011, according to Professor Malcolm Chalmers of the Royal United Services Institute, current "planned levels of defence spending should be enough for the United Kingdom to maintain its position as one of the world's top military powers, as well as being one of NATO-Europe's top military powers. Its edge – not least its qualitative edge – in relation to rising Asian powers seems set to erode, but will remain significant well into the 2020s, and possibly beyond." The Strategic Defence and Security Review 2015 committed to spending 2% of GDP on defence and announced a £178 billion investment over ten years in new equipment and capabilities. 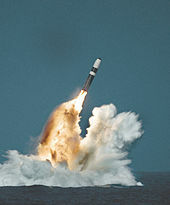 The United Kingdom is one of five recognised nuclear weapon states under the Non-Proliferation Treaty and maintains an independent nuclear deterrent, currently consisting of four Vanguard-class ballistic missile submarines, UGM-133 Trident II submarine-launched ballistic missiles, and 160 operational thermonuclear warheads. This is known as Trident in both public and political discourse (with nomenclature taken after the UGM-133 Trident II ballistic missile). Trident is operated by the Royal Navy Submarine Service, charged with delivering a 'Continuous At-Sea Deterrent' (CASD) capability, whereby one of the Vanguard-class strategic submarines is always on patrol. According to the British Government, since the introduction of Polaris (Tridents predecessor) in the 1960s, from April 1969 "the Royal Navy’s ballistic missile boats have not missed a single day on patrol", giving what the Defence Council described in 1980 as a deterrent "effectively invulnerable to pre-emptive attack". As of 2015, it has been British Government policy for the Vanguard-class strategic submarines to carry no more than 40 nuclear warheads, delivered by eight UGM-133 Trident II ballistic missiles. In contrast with the other recognised nuclear weapon states, the United Kingdom operates only a submarine-based delivery system, having decommissioned its tactical WE.177 free-fall bombs in 1998. The House of Commons voted on 18 July 2016 in favour of replacing the Vanguard-class submarines with a new generation of Dreadnought-class submarines. The programme will also contribute to extending the life of the UGM-133 Trident II ballistic missiles and modernise the infrastructure associated with the CASD. Former weapons of mass destruction possessed by the United Kingdom include both biological and chemical weapons. These were renounced in 1956 and subsequently destroyed. Overseas military installations of the United Kingdom, and locally raised units of British Overseas Territories. Military interventions since 2000: Palliser (Sierra Leone); Herrick (Afghanistan); Enduring Freedom (Horn of Africa); Telic (Iraq); Ellamy (Libya); and Shader (Islamic State of Iraq and the Levant). The British Armed Forces maintain a number of overseas garrisons and military facilities which enable the country to conduct operations worldwide. All of Britain's permanent military installations are located on British Overseas Territories (BOTs) or former colonies which retain close diplomatic ties with the United Kingdom, and located in areas of strategic importance. The most significant of these are the "Permanent Joint Operating Bases" (PJOBs), located on the four overseas territories of Cyprus (British Forces Cyprus), Gibraltar (British Forces Gibraltar), the Falkland Islands (British Forces South Atlantic Islands) and Diego Garcia (British Forces British Indian Ocean Territories). While not a PJOB, Ascension Island (another BOT) is home to the airbase RAF Ascension Island, notable for use as a staging post during the 1982 Falklands War, the territory is also the site of a joint UK-US signals intelligence facility. Qatar is home to RAF Al Udeid, a Royal Air Force outpost at Al Udeid Air Base which serves as the operational headquarters for No. 83 Expeditionary Air Group and its operations across the Middle East. A large Royal Navy Naval Support Facility (NSF) is located in Bahrain, established in 2016 it marks the British return East of Suez. In support of the Five Power Defence Arrangements (FPDA), the United Kingdom retains a naval repair and logistics support facility at Sembawang wharf, Singapore. Other overseas military installations include; British Forces Brunei, British Forces Germany, the British Army Training Unit Kenya, British Army Training Unit Suffield in Canada, British Army Training and Support Unit Belize, and British Gurkhas Nepal. Some British Overseas Territories also maintain locally raised units and regiments; The Royal Bermuda Regiment, the Falkland Islands Defence Force, the Royal Gibraltar Regiment and the Royal Montserrat Defence Force. Though their primary mission is "home defence", individuals have volunteered for operational duties. The Royal Gibraltar Regiment mobilised section-sized units for attachment to British regiments deployed during the Iraq War. The Isle of Man, a Crown dependency hosts a multi-capability recruiting and training unit of the British Army Reserve. The British Armed Forces place significant importance in the ability to conduct expeditionary warfare. While the armed forces are expeditionary in nature, it maintains a core of "high readiness" forces trained and equipped to deploy at very short notice, these include; the Joint Expeditionary Force (Maritime) (Royal Navy), 3 Commando Brigade (Royal Marines), 16 Air Assault Brigade (British Army) and No. 83 Expeditionary Air Group (Royal Air Force). Oftentimes, these will act in conjunction with a larger tri-service effort, such as the UK Joint Rapid Reaction Force, or along with like-minded allies under the UK Joint Expeditionary Force. Similarly, under the auspices of NATO, such expeditionary forces are designed to meet Britain's obligations to the Allied Rapid Reaction Corps and other NATO operations. In 2010, the governments of the United Kingdom and France signed the Lancaster House Treaties which committed both governments to the creation of a Franco-British Combined Joint Expeditionary Force. It is envisaged as a deployable joint force, for use in a wide range of crisis scenarios, up to and including high intensity combat operations. As a joint force it involves all three armed Services: a land component composed of formations at national brigade level, maritime and air components with their associated Headquarters, together with logistics and support functions. The British Armed Forces together with Kazakhstan's Peacekeeping Battalion KAZBAT and U.S. Army Central conduct regular Exercise Steppe Eagle. The exercise aims to strengthen interoperability among the armed forces of each nation to ensure security and stability as well as help prepare the soldiers of Kazakhstan to carry out United Nations peace-keeping operations. Exercise Steppe Eagle 2018 was held for the first time in the United States. The Royal Navy is a technologically sophisticated naval force, and as of August 2018 consists of 74 commissioned ships. Command of deployable assets is exercised by the Fleet Commander of the Naval Service. Personnel matters are the responsibility of the Second Sea Lord/Commander-in-Chief Naval Home Command, an appointment usually held by a vice-admiral. The Surface Fleet consists of amphibious warfare ships, destroyers, frigates, patrol vessels, mine-countermeasure vessels, and other miscellaneous vessels. The Surface Fleet has been structured around a single fleet since the abolition of the Eastern and Western fleets in 1971. The recently built Type 45 destroyers are technologically advanced air-defence destroyers. The Royal Navy is building two Queen Elizabeth-class aircraft carriers, embarking an air-group including the advanced fifth-generation multi-role fighter, the F-35B. A submarine service has existed within the Royal Navy for more than 100 years. The Submarine Service's four Vanguard-class nuclear-powered submarines carry Lockheed Martin's Trident II ballistic missiles, forming the United Kingdom's nuclear deterrent. Seven Astute-class nuclear-powered attack submarines have been ordered, with three completed and four under construction. The Astute class are the most advanced and largest fleet submarines ever built for the Royal Navy, and will maintain Britain's nuclear-powered submarine fleet capabilities for decades to come. The Royal Marines are the Royal Navy's amphibious troops. Consisting of a single manoeuvre brigade (3 Commando) and various independent units, the Royal Marines specialise in amphibious, arctic, and mountain warfare. Contained within 3 Commando Brigade are three attached army units; 383 Commando Petroleum Troop RLC, 29 Commando Regiment Royal Artillery, a field artillery regiment based in Plymouth, and 24 Commando Regiment Royal Engineers. The Commando Logistic Regiment consists of personnel from the Army, Royal Marines, and Royal Navy. The British Army is made up of the Regular Army and the Army Reserve. The army has a single command structure based at Andover and known as "Army Headquarters". Deployable combat formations consist of two divisions (1st Armoured and 3rd Mechanised) and eight brigades. Within the United Kingdom, operational and non-deployable units are administered by two divisions, Force Troops Command, and London District. The Army has 50 battalions (36 regular and 14 reserve) of regular and reserve infantry, organised into 17 regiments. The majority of infantry regiments contains multiple regular and reserve battalions. Modern infantry have diverse capabilities and this is reflected in the varied roles assigned to them. There are four operational roles that infantry battalions can fulfil: air assault, armoured infantry, mechanised infantry, and light role infantry. Regiments and battalions e.g. : the Parachute Regiment, exist within every corps of the Army, functioning as administrative or tactical formations. Armoured regiments are equivalent to an infantry battalion. There are 14 armoured regiments within the army, ten regular and four yeomanry (armoured reserve), of which four are designated as "Armoured", three as "Armoured Cavalry", and six as "Light Cavalry". Army 2020 Refine has seen developments which will further modify the Royal Armoured Corps. with two existing regiments forming the core of two new STRIKE Brigades. These two regiments, along with the Armoured Cavalry will be equipped with the "Ajax" armoured fighting vehicle, a new £3.5 billion procurement programme. The Ajax will be employed in the task organisation and roles of both Armoured Cavalry and Medium Armour. With a slight exception of the Household Cavalry, which maintains quasi-autonomy within the Household Division, armoured regiments and their yeomanry counterparts collectively form the Royal Armoured Corps. 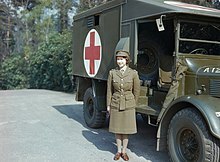 Arms and support units are also formed into similar collectives organised around specific purposes, such as the Corps of Royal Engineers, Army Air Corps and Royal Army Medical Corps. The Royal Air Force has a large operational fleet that fulfils various roles, consisting of both fixed-wing and rotary aircraft. Frontline aircraft are controlled by Air Command, which is organised into five groups defined by function: 1 Group (Air Combat), 2 Group (Air Support), 11 Group (Air and Space operations), 22 Group (training aircraft and ground facilities) and 38 Group (Royal Air Force's Engineering, Logistics, Communications and Medical Operations units). In addition 83 Expeditionary Air Group directs formations in the Middle East and the 38 Group combines the expeditionary combat support and combat service support units of the RAF. Deployable formations consist of Expeditionary Air Wings and squadrons—the basic unit of the Air Force. Independent flights are deployed to facilities in Afghanistan, the Falkland Islands, Iraq, and the United States. The Royal Air Forces operates multi-role and single-role fighters, reconnaissance and patrol aircraft, tankers, transports, helicopters, unmanned aerial vehicles, and various types of training aircraft. Ground units are also maintained by the Royal Air Force, most prominently the RAF Police and the Royal Air Force Regiment (RAF Regt). The Royal Air Force Regiment essentially functions as the ground defence force of the RAF, optimised for the specialist role of fighting on and around forward airfields, which are densely packed with operationally vital aircraft, equipment, infrastructure and personnel . The Regiment contains nine regular squadrons, supported by five squadrons of the Royal Auxiliary Air Force Regiment. In addition, it provides the UK's specialist Chemical, Biological, Radiological and Nuclear capability. It also provides half of the UK's Forward Air Controllers and the RAF's contribution to the Special Forces Support Group. By March 2008, the three remaining Ground Based Air Defence squadrons (equipped with Rapier Field Standard C) had disbanded or re-roled and their responsibilities transferred to the British Army's Royal Artillery. The Royal Fleet Auxiliary (RFA) operates 12 ships which primarily serve to replenish Royal Navy warships at sea, and also augment the Royal Navy's amphibious warfare capabilities through its three Bay-class landing ship dock vessels. It is manned by 1,850 civilian personnel and is funded and run by the Ministry of Defence. The Ministry of Defence Police (MDP) has an established strength of 2,700 police officers which provide armed security, counter terrorism, uniformed policing and investigative services to Ministry of Defence property, personnel, and installations throughout the United Kingdom. The Defence Equipment and Support (DE&S) is the merged procurement and support organisation within the UK Ministry of Defence (United Kingdom). It came into being on 2 April 2007, bringing together the MoD's Defence Procurement Agency and the Defence Logistics Organisation under the leadership of General Sir Kevin O'Donoghue as the first Chief of Defence Materiel. As of 2012[update] it has a civilian and military workforce of approx. 20,000 personnel. DE&S is overseen by the Minister for Defence Equipment, Support and Technology. The UK Hydrographic Office (UKHO) is an organisation within the UK government responsible for providing navigational and other hydrographic information for national, civil and defence requirements. The UKHO is located in Taunton, Somerset on Admiralty Way and has a workforce of approximately 1,000 staff. 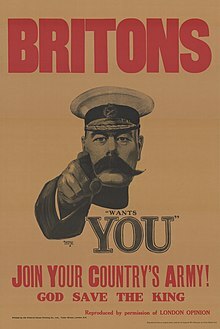 One of the most recognisable recruiting posters of the British Army; from World War I featuring Kitchener. All three services of the British Armed Forces recruit primarily from within the United Kingdom, although citizens from the Commonwealth of Nations and the Republic of Ireland are equally eligible to join. The minimum recruitment age is 16 years (although personnel may not serve on armed operations below 18 years, and if under 18 must also have parental consent to join); the maximum recruitment age depends whether the application is for a regular or reserve role; there are further variations in age limit for different corps/regiments. The normal term of engagement is 22 years; however, the minimum service required before resignation is 4 years, plus, in the case of the Army, any service person below the age of 18. At present, the yearly intake into the armed forces is 11,880 (per the 12 months to 31 March 2014). Excluding the Brigade of Gurkhas and the Royal Irish Regiment, as of 1 April 2014 there are approximately 11,200 Black and Minority Ethnic (BME) persons serving as Regulars across the three service branches; of those, 6,610 were recruited from outside the United Kingdom. In total, Black and Minority Ethnic persons represent 7.1% of all service personnel, an increase from 6.6% in 2010. Since the year 2000, sexual orientation has not been a factor considered in recruitment, and homosexuals can serve openly in the armed forces. All branches of the forces have actively recruited at Gay Pride events. The forces keep no formal figures concerning the number of gay and lesbian serving soldiers, saying that the sexual orientation of personnel is considered irrelevant and not monitored. Women have been integrated into the British Armed Forces since the early days, including flying fast jets and commanding warships or artillery batteries. However, they remain excluded from primarily close combat units in the Army (Royal Armoured Corps and Infantry), Royal Marines, and Royal Air Force Regiment. As of 1 April 2014, there are approximately 15,840 women serving in the armed forces, representing 9.9% of all service personnel. The first female military pilot was Flight Lieutenant Julie Ann Gibson while Flight Lieutenant Jo Salter was the first fast-jet pilot, the former flying a Tornado GR1 on missions patrolling the then Northern Iraqi No-Fly Zone. Flight Lieutenant Juliette Fleming and Squadron Leader Nikki Thomas recently were the first Tornado GR4 crew. While enforcing the Libyan No-Fly Zone, Flight Lieutenant Helen Seymour was identified as the first female Eurofighter Typhoon pilot. In August 2011, it was announced that a female Lieutenant Commander, Sarah West, was to command the frigate HMS Portland. In July 2016, it was announced that women would be allowed to serve in close combat, starting with the Royal Armoured Corps. In July 2017, the Secretary of Defence announced that women would be allowed to enlist in the RAF Regiment from September 2017, a year ahead of schedule. In 2018, women were allowed to apply for all roles in the British military, including the special forces. Defence Review – The process by which government of the United Kingdom decides upon its overall defence policy. Military Covenant – The mutual obligations between the nation and its Armed Forces. Network-enabled capability – British military concept of achieving enhanced military effect through the better use of information systems. Similar to the US concept of network-centric warfare. ^ Also referred to as the Armed Forces of the United Kingdom. ^ The current structure of defence management in Britain was set in place in 1964 when the modern day Ministry of Defence (MoD) was created (an earlier form had existed since 1940). The MoD assumed the roles of the Admiralty, the War Office and the Air Ministry. ^ Other Personnel includes personnel of the Military Provost Guard Service, Regular Reserves called up for duty and the Sponsored Reserves. ^ UK Service Personnel is a term used by the Ministry of Defence, and comprises UK Regulars, the Brigade of Gurkhas, the Volunteer Reserve and Other Personnel (I.e the Military Provost Guard Service, Regular Reserves called up for duty and the Sponsored Reserves). ^ a b c d e f g h  Archived 6 March 2019 at the Wayback Machine. 1 January 2019. MoD. Published 21 February 2018. Retrieved 2 March 2019. See table 1, page 4. ^ "Where Are The Armed Forces Deployed This Festive Season?". Archived from the original on 21 March 2019. ^ "IISS Military Balance 2019". Archived from the original on 15 February 2019. ^ "Defence Expenditure of NATO Countries (2011-2018)" (PDF). NATO Public Diplomacy Division. Archived from the original (PDF) on 30 October 2018. Retrieved 23 November 2018. ^ a b Johnston, Douglas M.; Reisman, W. Michael (2008). The Historical Foundations of World Order. Leiden: Martinus Nijhoff Publishers. ISBN 978-9047423935. , pp. 508-10. ^ a b c d "The Status and Location of the Military Installations of the Member States of the European Union" (PDF). Policy Department External Policies: 13–14. February 2009. Archived (PDF) from the original on 24 September 2015. Retrieved 21 October 2014. ^ Schmidt, Karl J. (1995). An Atlas and Survey of South Asian History. M.E. Sharpe. p. 74. ISBN 978-1563243332. ^ Hew Strachan, Hew (1978). "Soldiers, Strategy and Sebastopol". Historical Journal. 21 (2): 303–325. doi:10.1017/s0018246x00000558. JSTOR 2638262. ^ a b Lambert, Andrew. "The Crimean War". The BBC - History. The BBC. Archived from the original on 10 December 2015. Retrieved 21 January 2016. ^ Mallinson, Allan (2009). The Making of the British Army. Bantam Press. ISBN 978-0-593-05108-5. ^ "Commonwealth War Graves Commission Annual Report 2014-2015 p. 38". Commonwealth War Graves Commission. Commonwealth War Graves Commission. Archived from the original on 25 June 2016. Retrieved 1 July 2016. ^ Gibran, Daniel K. (1998). The Falklands War : Britain versus the past in the South Atlantic. Jefferson, N.C.: McFarland. p. 161. ISBN 978-0786404063. ^ a b Hyde-Price, Adrian (Professor) (9 January 2007). European Security in the Twenty-First Century: The Challenge of Multipolarity. Routledge. p. Chapter - Britain, France and the multipolar challenge. ISBN 978-1134164400. Retrieved 26 June 2016. Professor of International Politics, Adrian Hyde-Price, highlights that in the post-Cold War era both Britain and France have re-focused their attention "towards expeditionary warfare and power projection. Power projection has always been an element of British and French military thinking given their residual over seas interests, but it has now moved centre stage." ^ Forces Queen and Armed Forces Archived 22 October 2016 at the Wayback Machine, royal.uk. ^ "Whose hand is on the button?". BBC. 2 December 2008. Archived from the original on 21 February 2009. Retrieved 14 March 2009. ^ gov.uk MoD – reserves and cadet strengths Archived 8 March 2016 at the Wayback Machine, table 4 page 13. See note 2. April 2014. ^ gov.uk MoD – reserves and cadet strengths Archived 17 April 2016 at the Wayback Machine, table 1a-page 10. 12 July 1690. ^ a b International Institute for Strategic Studies: The Military Balance 2016. Routledge. 9 February 2016. ISBN 9781857438352. Archived from the original on 14 June 2016. Retrieved 19 June 2016. ^ "UK announces rapid strike forces, more warships in new defence plan". Reuters. 23 November 2015. Archived from the original on 24 November 2015. Retrieved 23 November 2015. ^ "PM pledges £178 billion investment in defence kit". Ministry of Defence. 23 November 2015. Archived from the original on 23 November 2015. Retrieved 23 November 2015. ^ "The Future United Kingdom Strategic Deterrent Force" (PDF). The Defence Council. July 1980. Retrieved 17 May 2012. ^ "The Future of the United Kingdom's Nuclear Deterrent" (PDF). Ministry of Defence. 4 December 2006. Archived (PDF) from the original on 6 December 2006. Retrieved 5 December 2006. ^ "UK and Qatar sign pact to combat jihadis and cyber warfare". Financial Times. 2 November 2014. Archived from the original on 8 January 2015. Retrieved 3 November 2015. ^ "Royal Navy's new Bahrain base seriously enhances Britain's ability to defend the Gulf". The Telegraph. 10 November 2016. Archived from the original on 17 November 2016. Retrieved 17 November 2016. ^ "The British Army in Brunei". www.army.mod.uk/. Ministry of Defence. Archived from the original on 9 June 2016. Retrieved 20 June 2016. ^ "The British Army in Germany". www.army.mod.uk/. Ministry of Defence. Archived from the original on 5 June 2016. Retrieved 20 June 2016. ^ "The British Army in Africa". www.army.mod.uk/. Ministry of Defence. Archived from the original on 30 June 2016. Retrieved 20 June 2016. ^ "The British Army in Canada". www.army.mod.uk/. Ministry of Defence. Archived from the original on 5 June 2016. Retrieved 20 June 2016. ^ "British Gurkhas Nepal". www.army.mod.uk/. Ministry of Defence. Archived from the original on 4 July 2016. Retrieved 23 June 2016. ^ "British Army opens first reserve unit opens on Isle of Man since 1968". BBC News. October 2015. Archived from the original on 25 October 2016. Retrieved 24 October 2016. ^ Wintour, Patrick (2 November 2010). "Britain and France sign landmark 50-year defence deal". The Guardian. London. Archived from the original on 2 February 2017. Retrieved 14 December 2016. ^ "Tuesday 2 November 2010 UK–France Summit 2010 Declaration on Defence and Security Co-operation". Number10.gov.uk. Archived from the original on 5 July 2011. Retrieved 26 June 2016. ^ "Steppe Eagle 2018: Interoperability with Partner Countries in Action". www.dvidshub.net. Archived from the original on 24 August 2018. Retrieved 24 August 2018. ^ "Royal Navy". royalnavy.mod.uk. Archived from the original on 30 September 2014. Retrieved 1 October 2014. ^ "MoD confirms £3.8bn carrier order". BBC News. 25 July 2007. Archived from the original on 11 September 2009. Retrieved 27 April 2010. ^ a b "RAF – Structure". Archived from the original on 21 February 2007. Retrieved 20 February 2007. ^ "Army marches with Pride parade". BBC News. 27 August 2005. Archived from the original on 18 February 2006. Retrieved 6 November 2009. ^ "The LGBT community in the Armed Forces". London Gay Pride official website. 11 June 2008. Archived from the original on 27 February 2014. Retrieved 6 November 2009. ^ Leake, Jonathan; Philip Cardy (28 August 2005). "Army on parade for gay recruits". London: The Times. Archived from the original on 29 May 2010. Retrieved 6 November 2009. ^ Haynes, Deborah (23 May 2009). "The Top Gun girl and the Tornado fast jet". The Times. London. Archived from the original on 12 May 2011. Retrieved 31 March 2011. ^ Tornados and Taliban are all in a day's work Archived 13 May 2011 at the Wayback Machine. This is Devon (2009-12-29). Retrieved on 2013-08-24. ^ Collins, Nick (24 March 2011). "First woman to fly Typhoon enforces no-fly-zone". The Daily Telegraph. London. Archived from the original on 11 February 2018. Retrieved 5 April 2018. ^ "Royal Navy appoints first female warship commander". BBC News. 8 August 2011. Archived from the original on 12 November 2018. Retrieved 21 July 2018. ^ "Ban on women in ground close combat roles lifted". UK Ministry of Defence. 8 July 2016. Archived from the original on 9 July 2016. Retrieved 15 July 2016. ^ "RAF opens close combat role to women ahead of schedule". UK Ministry of Defence. 13 July 2017. Archived from the original on 28 July 2017. Retrieved 13 July 2017. ^ Lizzie Dearden Home Affairs Correspondent @lizziedearden. "Women now allowed to apply for Royal Marines and all other frontline military roles, defence secretary announces". The Independent. Archived from the original on 25 October 2018. Retrieved 25 October 2018. Wikimedia Commons has media related to Military of the United Kingdom. Look up Appendix:Glossary of British military slang and expressions in Wiktionary, the free dictionary.